Oh August, the month where we finally saw rain (and cursed it) and squeezed in as many festivals as physically possible. But, before we head into autumn, let's look back fondly on the final weeks of summer. Indie legends, Kasabian decided to make an appearance at O2 Academy Brixton this month, because, well why not? Cramming in a huge, stadium-worthy production, they kept the crowd on their toes as they performed banger after banger, from opener, ‘Club Foot’ to the finale of ‘Fire’, it was one of the most colossal performances ever witnessed in the venue. Not to mention the blinding neon coat that Serge decided to wear as well. Feel free to come back soon, lads. It’s not often you have a singer as iconic as Steven Tyler walking through our venue doors, but the Aerosmith front man came to O2 Forum Kentish Town last month and put on an outstanding show. Naturally the night mainly consisted of the biggest sing-a-longs we’ve ever heard, as he performed all the Aerosmith classics, as well as covers by The Beatles and Janis Joplin to name a few. Not forgetting his roots, though, he was also spotted walking to the side of stage to sing to daughter, Liv Tyler, before returning to the crowd and working the room like he’s done many a time over the years. This is certainly a show neither us, or the fans will forget in a long time. The old school punks were out in full force for the Dead Kennedys, as the punk heroes proved that rock is still alive and well at O2 Academy Oxford. Working through their political, ferocious and damn well brilliant catalogue of music, the band sounded as fresh and relevant as they did back in the 80s and it was fantastic to see them still delivering the live energy they became so well known for. Having had his show upgraded to O2 Academy Newcastle at the last minute, the excitement for electronic artist, Bonobo was unparalleled. His entire performance was spectacular, leaving the audience in awe as he masterfully transformed songs from latest album, Migration into extravagant sounds that danced around the venue walls. If you can’t see the real Daft Punk, then an orchestral rendition of all their hits is a very good second best. Re:Imagine have transformed the work of the famous French, dance duo into a stunning two-hour set, which includes favourites such as, ‘One More Time’, ‘Get Lucky’ and ‘Around The World’, all performed by a talented 16-piece orchestra. Selling out O2 Academy Bristol was an easy task and judging by the reaction to the show, this is a masterpiece everyone needs to see while they can. 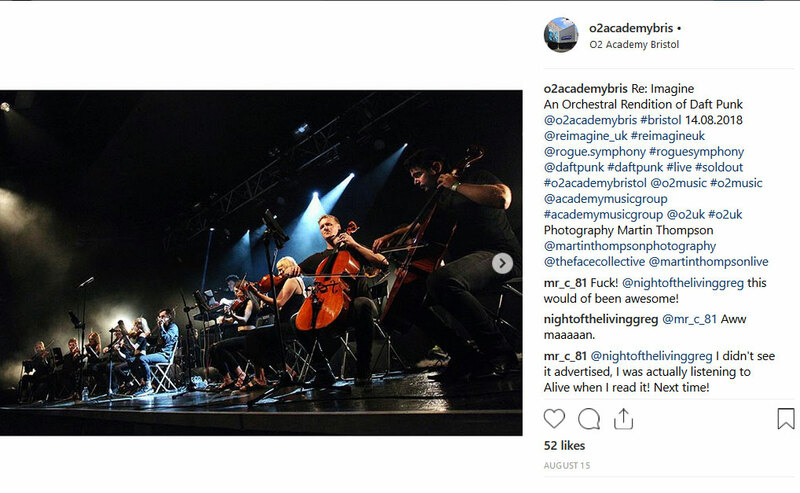 It’s always nice to take a trip down memory lane sometimes and that’s exactly what Gomez did at their recent O2 Academy Oxford show. Celebrating the 20th anniversary of their extraordinary album, Bring It On, the indie-rock outfit treated their fans to a performance of the album in full, whisking everyone away on a nostalgic trip of 90s bliss. Glasgow was filled with glamour when 10’s Across The Board rolled into town. Featuring five of the fiercest queens from Season 10 of RuPaul’s Drag Race, Aquaria, Asia, Kameron, Miz and Yuhua made the stage their own as they left the audience laughing, crying and gasping with their performances. High energy dance routines, gag-worthy gowns and dark-witted humour well all on offer throughout the night, with the brilliant Victoria Secret and Danny Beard proving they’re the perfect hosts, providing unforgettable entertainment throughout. Yung Fume’s headline show at O2 Academy Islington was always going to be a wild one. Taking to the stage a week after releasing his new EP, Too Much Wave 2, this was fans’ first taste of the new material live and it went down an absolute storm. The room was bouncing from start to finish, soaking up Fume’s unmatched talent and thriving off his music. There wasn’t much that could have bettered the performance, but Fume had a few surprises up his sleeve and their names were JME, Stormzy, M Huncho and upcoming singer, BRYN, which, as you can imagine, sent the crowd into a frenzied whirpool of bodies. The energy throughout was contagious and Yung Fume only cemented his name as one of the most exciting MC’s to come from the UK, who has so much more to accomplish from here on out. With Star Shaped Festival only a few weeks away now, we thought we'd put together the ultimate 90s Britpop playlist to get you in the mood. With so many huge bands in and out of our doors, it’s easy to forget those bands that are out there, tirelessly working their way up to the top who deserve your attention. This month, we’re putting the spotlight on socially-conscious, genre-bending artist, Yungblud.